MC 620 (scurred) is an exciting junior herd sire at MC Ranch. Sired by MC 220, he is a direct result of MC Ranch’s StarFive program. 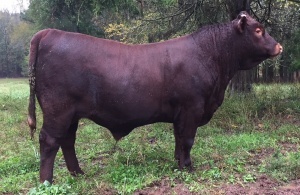 This 3/4 Santa Gertrudis x 1/4 Red Angus cross can be bred to purebred Santa Gertrudis with the resulting offspring registered as purebred Santa Gertrudis. MC 620 topped a recent gain test with a scanned IMF of 5.08!